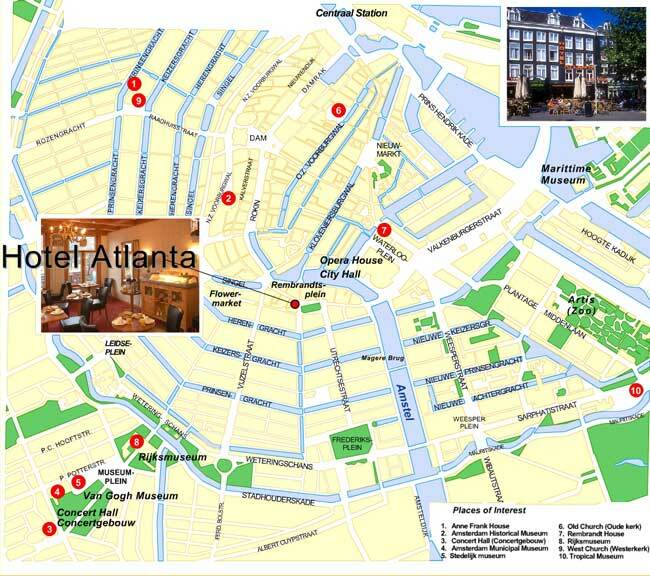 Hotel Atlanta is located in the heart of Amsterdam's old and historical Quarter with a unique view verlooking the famous Rembrandtsquare. The terraced square is especially enjoyable on a warm summer's day. Our prime location lends itself directly to the city's flower market, opera house, museums, canal boats, shopping, bars, restaurants, clubs and lots more. The RAI congress centre is within reach by public transport (tram 4, 20 minutes). Our location is marked on the map below, as well as varrious places of interest. Click the red dots to visit their website. In addition you can also find us on Google Maps, just click here.